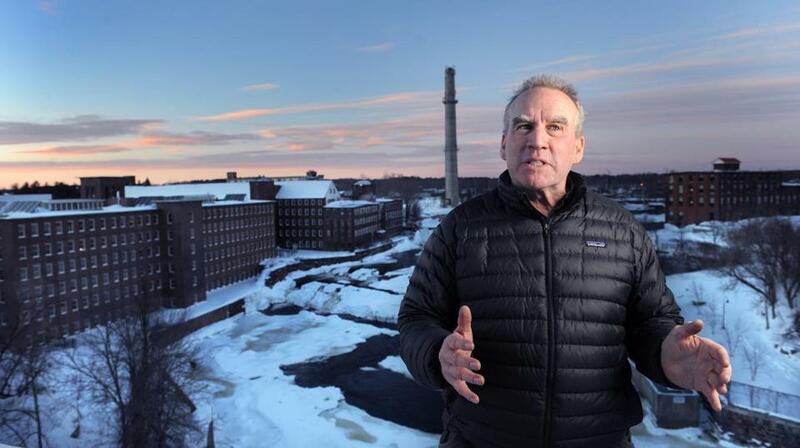 Doug Sanford has leading Biddeford’s resurgence by investing in unused properties, including the Pepperell mill, background. BIDDEFORD, Maine — Like other mill towns dotting the landscape of New England, Biddeford’s economic fortunes tracked those of its textile industry and the mills bordering the Saco River. When textile manufacturing moved elsewhere — first south, then offshore — the city, particularly its downtown, languished. For much of the past half-century, the hulking mill district cast a shadow, literally and figuratively, over Biddeford’s downtown, becoming a symbol of the city’s decline and decay. Even as places like Providence and Lowell, Mass., found new life in old mills, Biddeford struggled with abandoned industrial space and empty storefronts, so desperate for jobs and investment that it sited a trash-to-energy power plant in one of them, just a few blocks from City Hall. Today, Biddeford’s 35-acre mill district is at the center of a downtown revival, housing an array of startups and small businesses — from manufacturers to a distillery to an art school — that together employ more than 400 workers. Two weeks ago, Portland Pie Co. opened a 130-seat restaurant in the sprawling Pepperell Mill complex. And less than a month ago, a Kennebunkport company completed the purchase of the 233,000-square-foot Lincoln Mill for a planned $50 million development that would include 100 market rate loft apartments and condominiums, and a 80-room luxury hotel. A combination of factors have come together in recent years to provide the spark to downtown redevelopment, including an improving Southern Maine economy, affordable commercial rents, the shutdown of the trash plant, and an influx of newcomers attracted by a walkable neighborhood with new coffee shops, boutiques, and other stores. 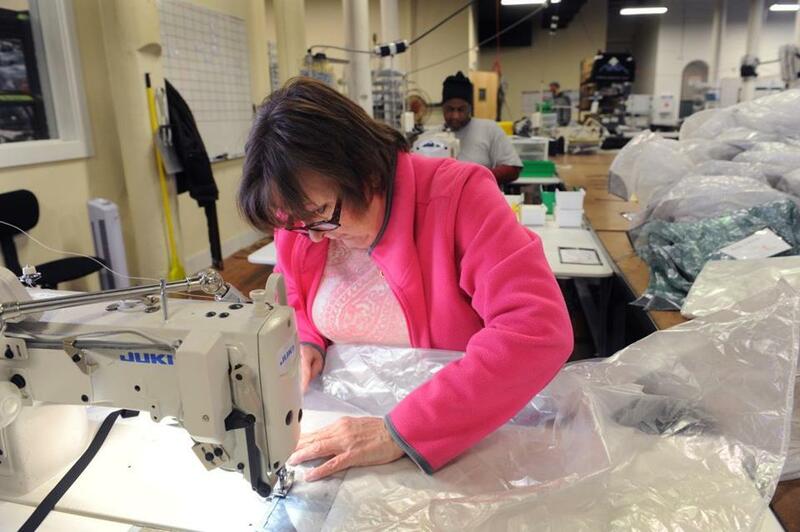 Deena Presby is a stitcher at Hyperlite Mountain Gear, where she’s helping to keep Biddeford’s textile tradition alive. Another key ingredient: the vision of developers like Doug Sanford, who saw the potential of both the mills and a city with a major hospital, Southern Maine Medical Center, a well-regarded university, the University of New England; and easy access to beaches. Biddeford is a city of 21,000 residents, located about 90 miles north of Boston. It became a textile center in the mid-1800s, when a group Boston industrialists were drawn to the power of the Saco River. At its peak in the early 20th century, more than 10,000 people worked in the mills in Biddeford, and Saco, across the river. The mills began closing in 1960s, followed by the downtown businesses that had supported them and their workers. At the same time, retail development was moving from central business districts to strip malls, shopping centers, and big boxes on the periphery. By the 1980s, both foreclosures and empty store fronts were multiplying. Desperate for investment and tax revenues, and with few options, the city in 1987 sited the trash-to-energy incinerator. But that only made things worse. Garbage trucks queued up along downtown streets. The smell of rotting trash was in the air. Ash showered downtown businesses. 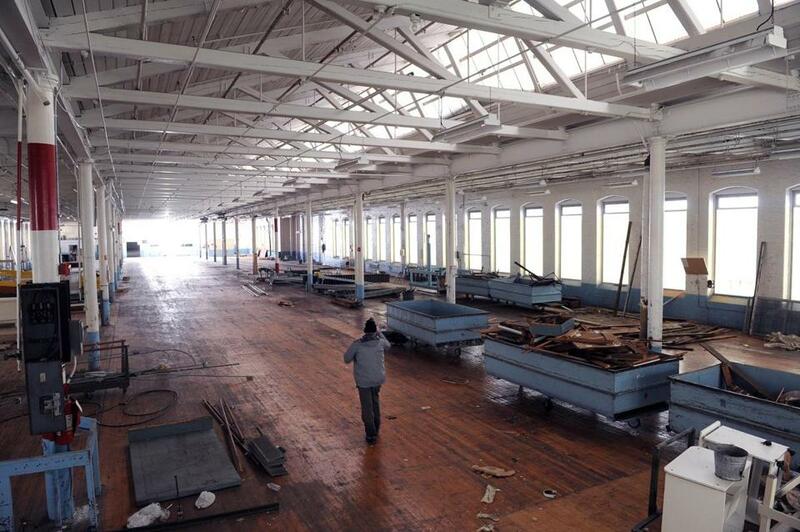 The interior of a mill building owned by Doug Sanford, who predicts that this space will be used for offices. Through it all, Sanford kept buying and rehabbing individual downtown properties, convinced that people and businesses would one day return. Then, in 2004, he took a leap, buying the vacant, 370,000-square-foot North Dam mill, part of the larger Pepperell Mill campus, for about $300,000, according to property records. Five years later, when the city’s last textile maker shut down, he acquired the rest of the Pepperell complex for $1.1 million, giving him control of a total of 1.1 million square feet of mill space. Sanford, however, would need to stay patient. The recent recession hit Biddeford hard. In addition to the 120 jobs lost when the textile company closed, the city lost 350 jobs when the Hostess Bakery plant shuttered and more than 100 after a Lowe’s home improvement store closed. “We were still trying to stop the bleeding,” said Daniel Stevenson, Biddeford’s economic development director. As the economy improved, city officials looked ahead. Stevenson and Casavant, elected mayor in 2011, reached out to local businesses, developers, and residents for ideas to boost economic growth, particularly downtown. A tipping point came in 2012, when the city shut down the trash-to-energy plant. That decision opened the door for Tim Harrington, a Kennebunkport developer, and his Atlantic Holdings LLC. Harrington recently acquired the former Lincoln Mill with plans to invest $50 million to transform the complex across from City Hall into a luxury hotel and loft-style apartments and condominiums. The project is expected to create 200 full-time jobs and 350 construction jobs. “We would have never chosen the Lincoln Mill if the incinerator was still in downtown,” said Harrington. Harrington also credits Sanford’s pioneering efforts at the other end of Main Street, which demonstrated the potential of the mills. Sanford redeveloped and marketed the property as a business incubator, offering startups and other small firms rents that are nearly half those in nearby Portland. About 150 companies today call the Pepperell Mill campus home. The city’s textile industry has even had a small rebirth in Sanford’s mills, with companies such as Angelrox, which makes the clothing line of the designer Roxi Suger; Saco River Dyehouse, which dyes yarns; and Hyperlite Mountain Gear, which designs and manufactures backpacks, tents, and other outdoor gear from durable, lightweight fabrics. Hyperlite was launched by two brothers in their father’s garage in Kennebunk in 2010, but they soon decided they needed a new location when they found themselves testing tents by staking them in the front yard. They moved to Biddeford in 2011 and today, the company employs 17. “What we found attractive here was the size — the room and space to grow,” said Dan St. Pierre, who founded the company with his brother, Mike. Tammy Ackerman became captivated by the mills while visiting Maine in 2006. Today, after relocating from Nevada, she is among a colony of artists that has located in downtown and Sanford’s mills, attracted, like Hyperlite, by low-cost space. Ackerman, a graphic designer, later cofounded Engine, a nonprofit that promotes the arts in the city. Located on Main Street, in the historic building of a former department store, Engine serves as a hub for arts and education. When she saw the mills for the first time, Ackerman said she was struck by their beauty. “We’ve been able to utilize those spaces often for performances and other events,” she said. This increasing activity meanwhile, has led to more investment in the downtown. The Palace Diner, Maine’s oldest, is an example. Greg Mitchell handed the check to Jon Jacques at the Palace Diner in Biddeford. 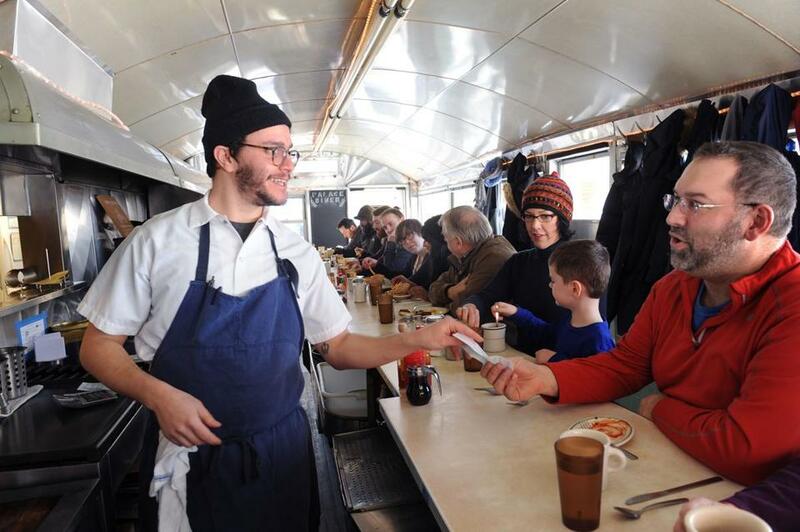 Mitchell is co-owner of Maine's oldest diner. Chad Conley and Greg Mitchell worked as chefs in Portland’s well-regarded restaurants, but wanted their own place to run. When the diner came up for sale last year, they investigated, sensed the momentum in downtown Biddeford, and bought it, opening last March. The Palace, which once fed hungry mill workers, was selected by Bon Appetit magazine as one of the 50 best new restaurants in America in 2014. Despite progress, the revitalization of downtown Biddeford faces challenges. 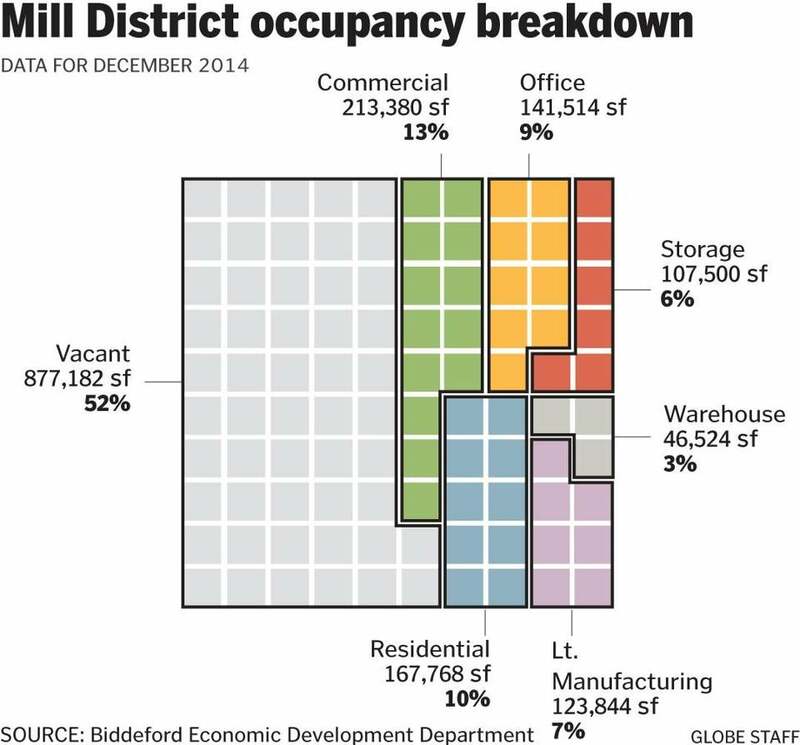 Nearly half the mill space remains vacant. Merchants still face competition from suburban malls and big box stores. Tourists still bypass Biddeford for the bustling Old Port and lively restaurant scene in Portland, just 15 minutes away. Sanford, hardened by 30 years of shifting economic trends, fluctuating the real estate markets, and changing political leadership, said Biddeford needs to keep a long-term view, that a half-century of decline isn’t reversed in a few years. The city, he said, needs to invest in public works, such as parking garages, promote the downtown, and continue to provide a climate that encourages businesses to invest. Jim Baumer can be reached at jim.baumer@gmail.com. Follow him on Twitter @jbomb62.